Found in the absolute best chalet location in Courchevel, a winter wonderland next door to Chalet Edelweiss, surrounded by snow covered trees; Les Gentianes is a truly ski-in ski-out chalet located right on the Bellecote piste, just beside the village of Courchevel 1850. Built in 2010 in a sympathetic alpine style with wood interiors, exposed ceiling beams and a cozy fireplace in the living room, Les Gentianes has 7 double bedrooms, all with en-suite bathrooms over approximately 750m². It is truly spectacular, with a ski-room, swimming pool, Jacuzzi and hammam, independent massage room, gym, cinema, indoor parking and is completely ski in/ski out. As you ski off the ski-room terrace, you go directly through the trees and onto the Bellecote piste. The large living/dining area has spectacular views over the trees, piste and mountains that surround it, and underwent a €500,000 remodeling and refurbishment in 2016. The chalet is away from the main road in a private residence, with the center of Courchevel 1850 just a five minutes' walk down the slope to its renowned restaurants, bars, shopping and nightlife. All ‘Courchevel Prestige Chalets’ come with your own personal butlers, cleaners, chefs and driver. Although the chalet is away from the main road in a private residence, the center of Courchevel is less than five minutes' walk away, with its renowned restaurants, bars, shopping and nightlife. 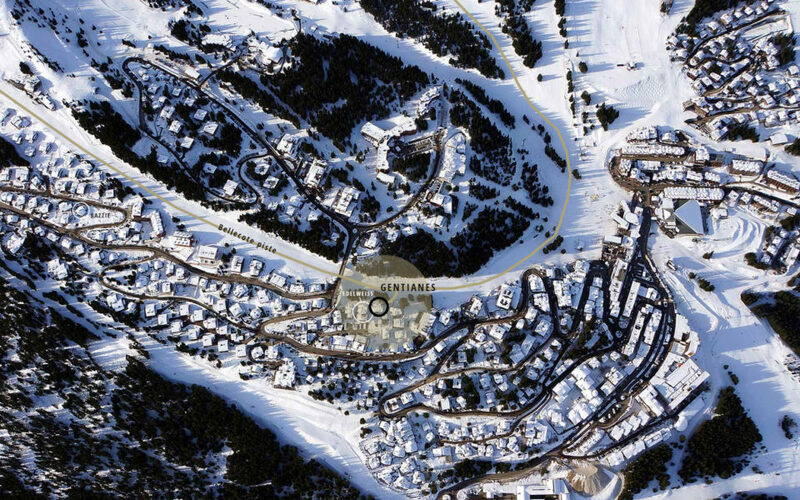 Chalet Gentianes is located right on the Bellecôte piste (ski in ski out) nested in the prestigious and quiet Residence de Bellecôte and 500 meters from the village of Courchevel. The ski room literally is right on the ski slope.